La Isla Blanca-white island is the second largest Balearic Island. The Cala Tarida is west of the island in a grown resort with a village character. The beach in the bay scored in the 90 years the blue flag of the European Union for water quality and cleanliness. From our house you are in about 5 minutes on the beach. 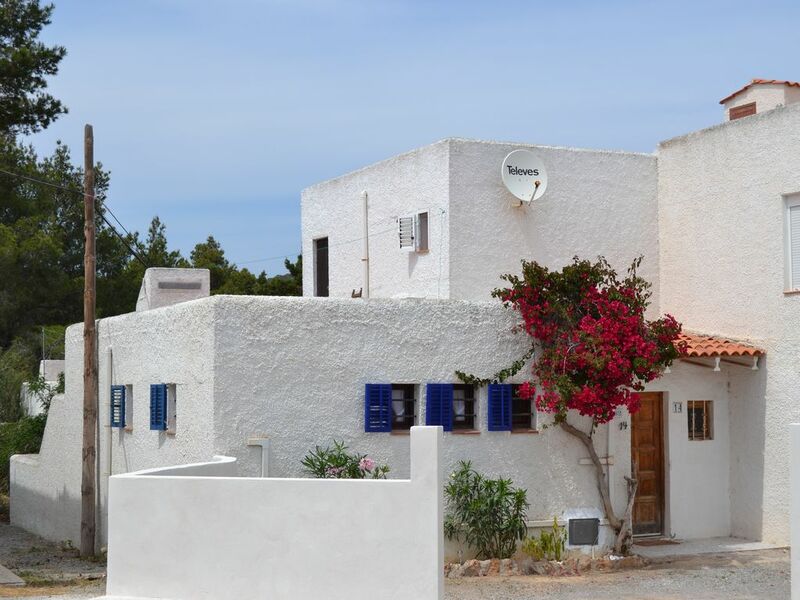 The house has two bedrooms with two beds, two bathrooms, kitchenette with electric oven and stove, living room, dining terrace and roof terrace. To San Antonio is about 15km until Eivissa (Ibiza Town) 30km. In the immediate vicinity of the bungalow, there are shops, restaurants, pharmacy and car rentals. Well equipped little house. Clean. Thoughtful bottle of wine and water on arrival. Good location. May be something lost in translation - it is not a bungalow. Second bedroom is upstairs, I only mention this as with young children we couldn't use the upstairs room. Great location for relaxing, exploring from and returning to. The property had everything we wanted. Lovely and cool inside with plenty of space but also a great area on the roof and out the back for sunbathing and enjoying breakfast. It was great to have a drive for the car rather than risk the paintwork in the local car park. The spar shop across the road was great for fresh croissants and supplies while the local beach 5 minutes away offers space and a number of places for food. For a treat, the cotton club was well worth the money for a sunset dinner. Taxis take ages to arrive and can't be booked...they just arrive when they can. It would be about €30 to Ibiza old town but more on your return if coming back late. The bus does come that way so is an option but renting a car is recommended to explore the island. Check Ibiza spotlight for advice. Karsten, thank you so much! Homeaway was an easy to use website with great rates. Genoten van ons verblijf in Cala Tarida. De woning is ruim, heerlijke zitruimte, twee terrassen en op loopafstand van het (wel tegenwoordig heel drukke) strand. Alles was aanwezig, en alhoewel de woning niet splinternieuw en modern is, was het een prettige woning met meer dan voldoende ruimte. Ik kom hier graag weer! Einfacher Einrichtungsstil, aber alles da was man braucht. Auch Handtücher!! La casa nel complesso è accogliente , abbastanza pulita e completamente arredata , molto vicina al mare e a servizi di prima necessità. Comoda l'area adiacente alla casa per parcheggiare l'auto. Uniche note negative la presenza di insetti (tipo scarafaggi) e andrebbe un pochino ristrutturata la zona cucina, nella camera al piano terra si sente molto odore di umidità, televisione con solo canali esteri un solo canale italiano. Se non si hanno esigenze specifiche mi sento di consigliare questa casa anche perché' vi è' un buon rapporto qualità prezzo. La Isla Blanca- the White Island is the second largest Balearic Island. The Cala Tarida is west of the island in a grown resort with a village character. The beach in the bay has already received in the 90 years the blue flag of the European Union for water quality and cleanliness. Die angegebenen Zeiten beziehen sich auf zwei Personen. Für jede weitere Person erfolgt ein Aufschlag von 10€ pro Übernachtung.